The 5200 Pump Unit maximizes the Tunnel Boring System's capabilities with enhanced functionality to offer the utmost power and precision in many geological circumstances. The unit presents application flexibility with three independent hydraulic sources - two low-pressure sources for the Tunnel Boring Machine (TBM) boring head supply and one high-pressure source for jacking and Intermediate Jacking Stations (IJSs). Low-pressure hydraulic boring head supply is provided by two, 100 HP (74 kW), totally enclosed fan-cooled (TEFC) electric motors. 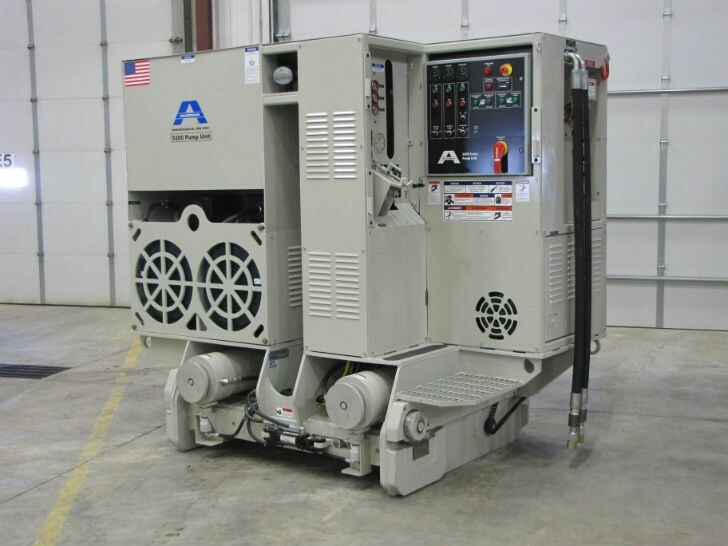 Each motor features variable displacement piston pumps managed with electronic displacement control, allowing the user to select between 30, 60, 90, or 120 gpm at the flip of a switch. The boring head system supplies 30-120 gpm of oil at 3,000 psi to all Akkerman TBMs or 30-60 gpm at 5,000 psi to Series II TBMs. The advanced 5,000 psi boring head supply is advantageous in demanding ground conditions which require increased cutter torque and greater horsepower in single feed applications. All jacking and IJSs functions are accomplished by a 12.5 gpm, 8,000 psi capable pump, driven by a 60 HP TEFC electric motor. At 8,000 psi, the jacking system offers 400 tons of jacking force and 30% more pressure for the IJSs. Operators will appreciate the handling of jacking functions with variable pump output and electronic valve actuation. A 240 gal (908 L) hydraulic tank supplies oil to the pumps and in-tank filtration keeps it free of contaminates. Oil also continuously flows through a dedicated cooling and filtration circuit. The importance of operator's safety is evident in the 5200 Pump Unit design. An emergency e-stop is located on the operator's platform and an optional remote cabled e-stop is available for in-shaft personnel. The control panel on the operator's station has an enhanced interface and simplified appearance. The 5200 Pump Unit touts many additional quality features. The unit can be hoisted from a single lift point. The location of the laser slot ensures an unobstructed laser path. Removable, vandal resistant, lockable doors protect the unit during when not in use. Electric is facilitated through a 400-amp, 480-volt, 3-phase connection. The 5200 Pump Unit is 90-in. (2,286 mm) tall, making it ideal for clearance when used with most pit shorting configurations.